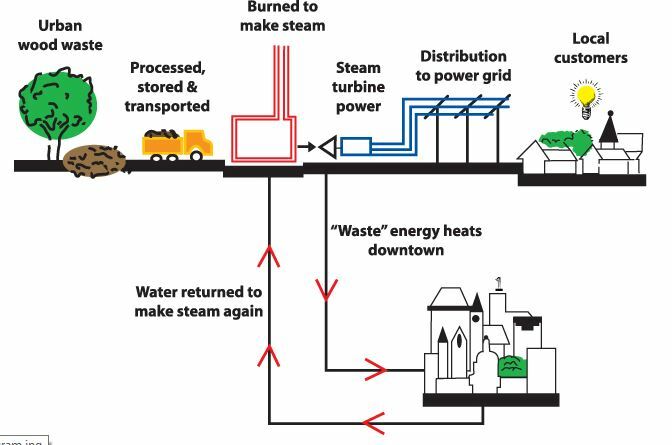 When it comes to generating energy from urban wood biomass, St. Paul, MN, is way ahead of the curve. For two decades, St. Paul Cogeneration has provided heat and electricity to area consumers. The main fuel source is urban wood residuals to the tune of about 50 truckload deliveries of wood chips each day. The vast majority of the chips are gathered from within 60 miles of the cogeneration plant. According to St. Paul Cogeneration’s website, sources include storm-damaged trees, tree trimmings, land clearing, clean construction residues such as pallets, habitat restoration and municipal and private tree and brush sites. Approximately 280,000 tons of urban wood residues are used each year, most of which would have wound up in landfills. The plant can simultaneously produce 65 megawatts of heat and up to 33 megawatts of electricity. Approximately 25 megawatts of this total – sufficient to power 20,000 homes – is supplied to the local electric utility. In 2013, St. Paul Cogeneration was the only American project to be recognized in a recent report on the potential of district energy by the United Nations Environment Program.